The Prefecture Council of the Main-Taunus-Kreis was founded in March 1998. Its task is to provide effective approaches to the prevention of criminal offenses and to implement them in cooperation with all social and state forces. The Preference Council operates as working groups of security, youth and social security, as well as security in schools. 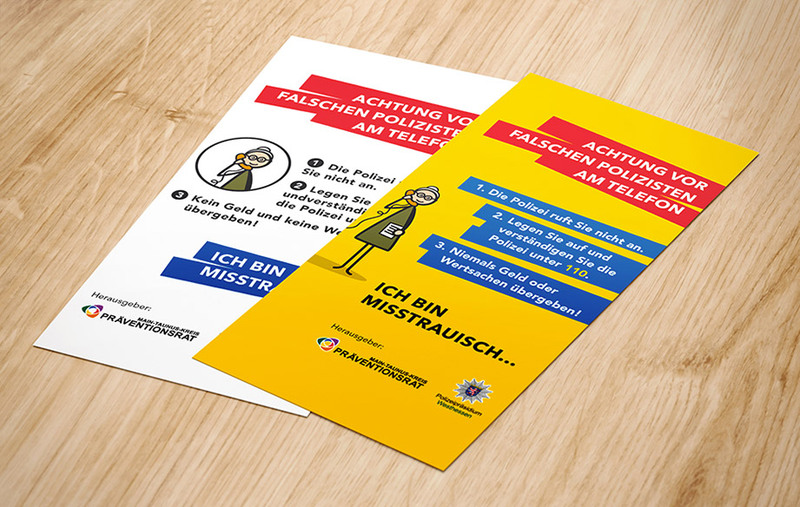 The district governing council is composed of district councilors, district administrators, heads of the responsible state prosecutors, police chief and police director of the Main-Taunus-Kreis. 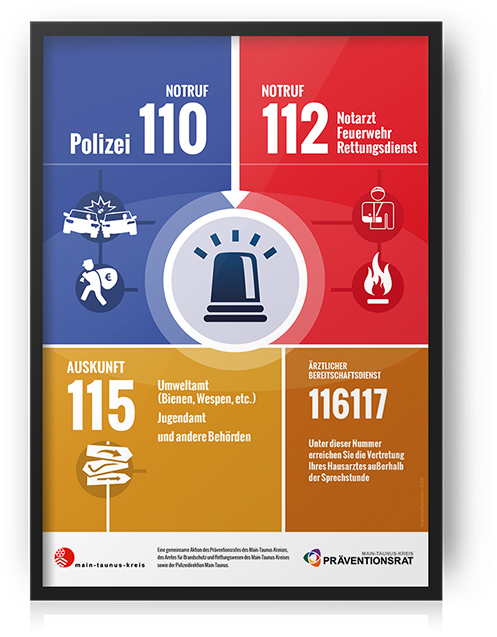 Campaign for representing and distinguishing numbers of emergency in the district of Main Taunus Kreis, Germany. The purpose of the association “Citizens and police for more security” is to promote the participation of citizens in the maintenance of public security. This is done through public relations work and by honoring citizens who have committed themselves to others by helping to clarify or prevent a criminal offense. 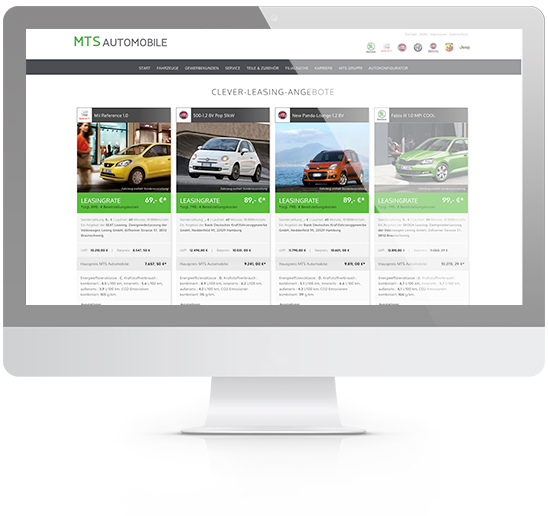 In accordance of the client’s needs, we created a very simple website, fully responsive with a focus on informations. 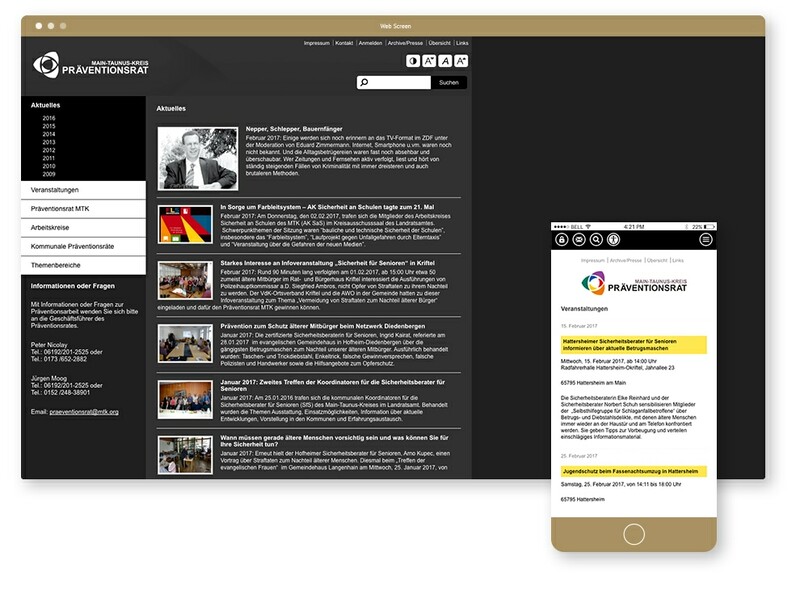 Particular attention was paid to the fact that website is accessible to a larger number of people, especially for people with visual impairments. 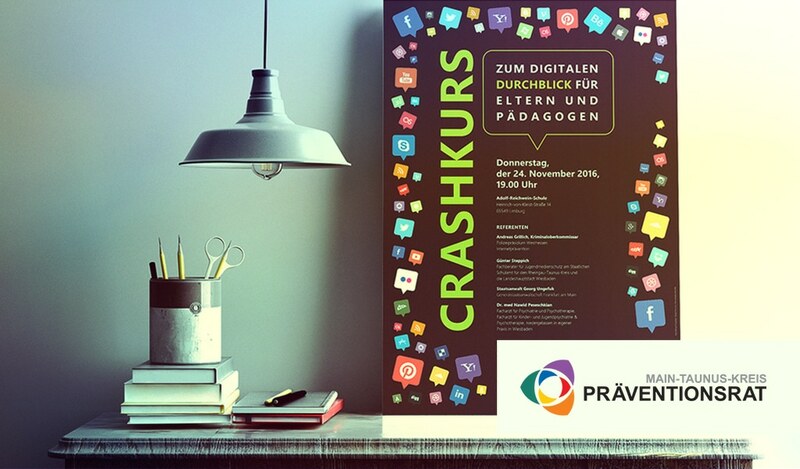 “Digital world of children and young people”. problematic content, dealing with personal data etc. 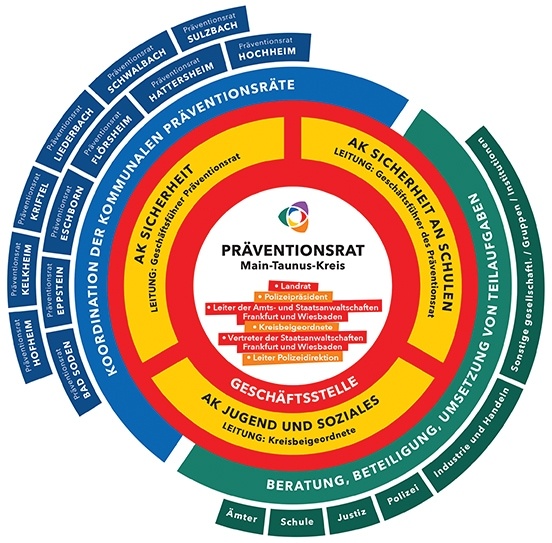 This flyer, supplemented by simple icons and diagrams, providing all the necessary information about Präventonsrat MTK and their field of activity. Older people are often victims of criminal acts. In doing so, the perpetrators use to exploit the good nature and willingness of the elderly to enrich themselves. For this reason, the project “Security Advisors for Senior Citizens” is intended to strengthen the trust of this age class and extend the knowledge on crime prevention. 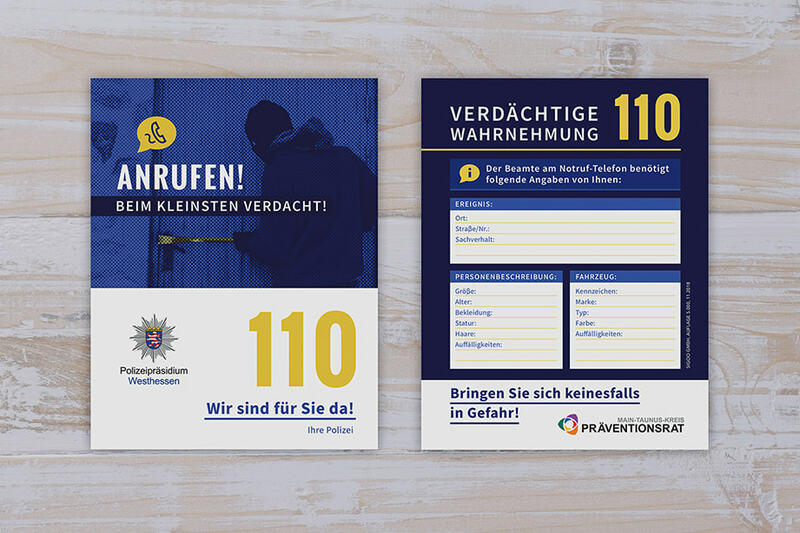 We created simple design that goes along with the idea of this project for a couple of German cities and municipalities. 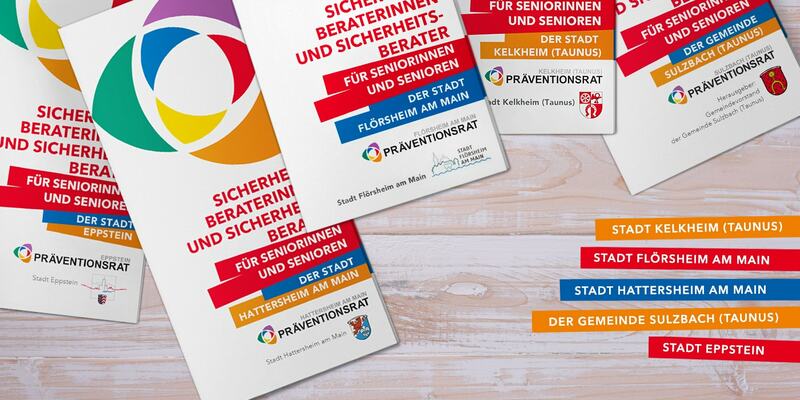 The Prevention Council of the Main-Taunus-Kreis and the Police Directorate Main-Taunus made a campaign with a purpose of informing and warning senior citizens on potentional trick thefts and frauds. 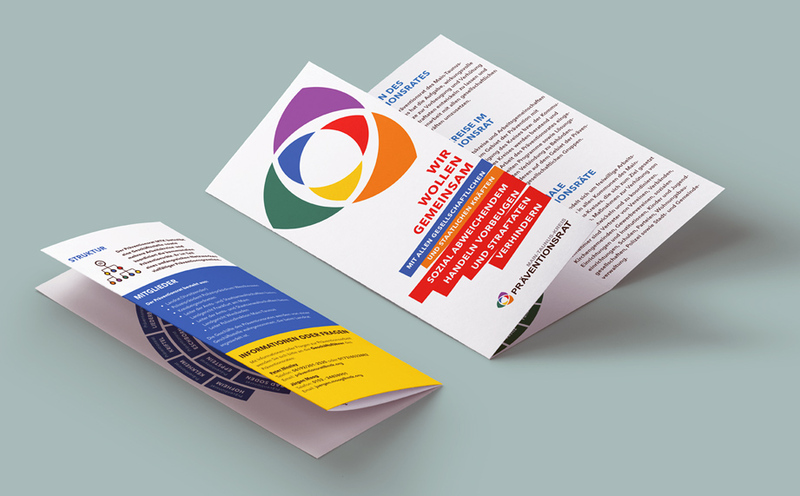 With the intention to make the information visible and primary, we designed poster and postcards for this campaign, in bright colors and very simple. 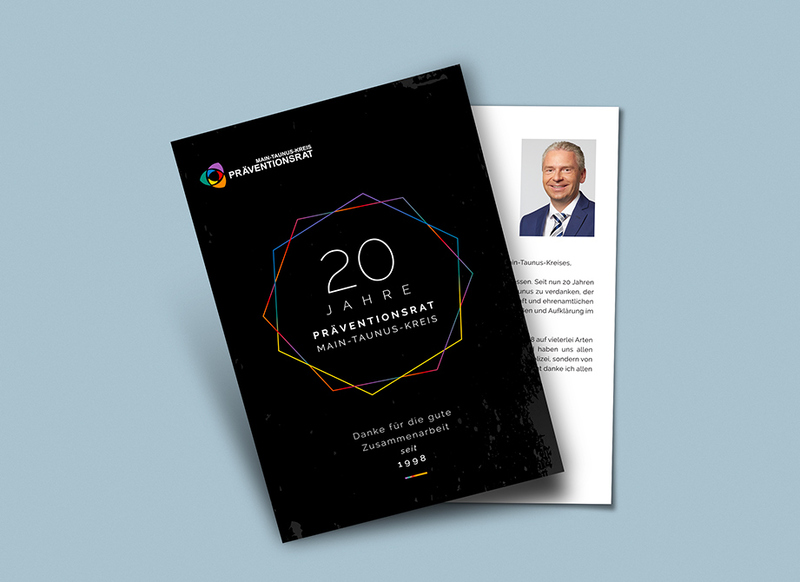 Postcard design for the 20th anniversary and mutual successful collaboration. The strong difference in color with dark background and geometric shapes in color with six sides which symbolize the parts of the logotype, all that gathered with colors which are common for Präventionsrat. 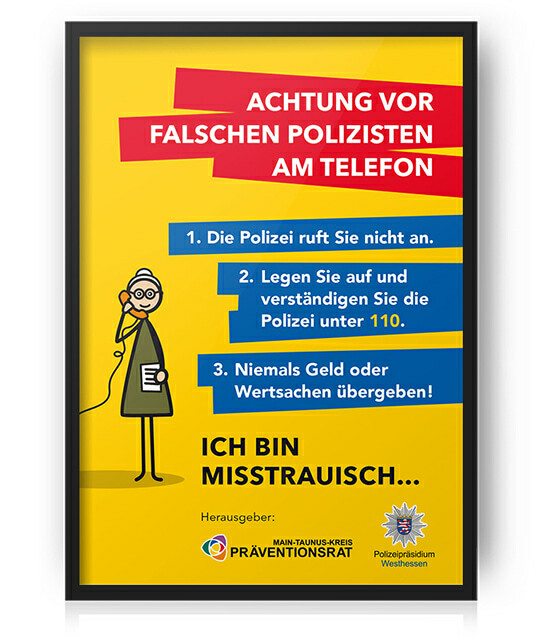 Postcard design for campaign with the title “Call at the slightest suspicion!”. The main goal of this campaign is to invite citizens to report any suspicious behavior or happening. The contrast of blue and yellow color with a clear message was the most important guideline for this design. On the other side of the postcard, citizens can find the form for person description who is involved in suspicious activities, data about their car and other information which may help police to identify and find the suspect.